I guess almost limitless funds, together with a largely formless homeland with few distinctive terrain features, can be useful for efficiently driving such a massive construction project to completion (not to mention the, er, “forced labor” as Amnesty International puts it). Still, that headline is misleading: from the article itself it becomes clear that Qatar is not yet ready to run a World Cup-size football tournament, although its progress is likely more advanced at this stage than any other host has achieved. The biggest stadium, Khalifa International Stadium, situated in the capital Doha, is now ready to host opening and closing ceremonies together with key games such as the Final. Indeed, in October of 2019 it is scheduled to host the world track & field championships. But that’s about it: Work remains ongoing on the remaining seven, as well as on the subway/metro system which is the country’s first such installation, being purpose-built for the occasion. How Much Is That in Real Money? 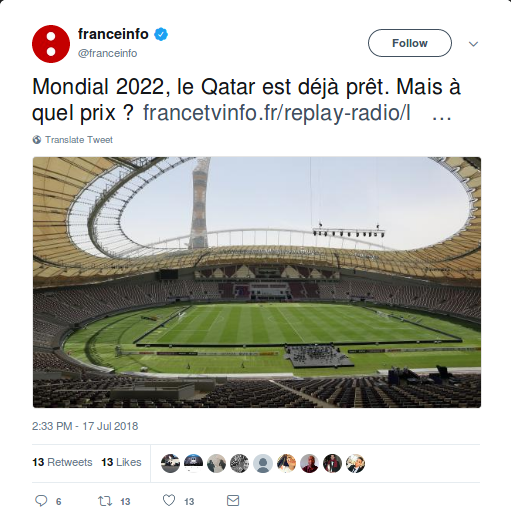 In money terms, writer Emmanuel Cugny calculates that Qatar will ultimately spend the equivalent of around €100 billion on World Cup 2020. That aforementioned subway system alone will cost around €31 billion. Plus, it says here that the authorities promise to have available 1.5 million hotel rooms (versus the normal FIFA requirement of 60,000); this presumably means some level of private infrastructural spending as well. And as Cugny takes care to note, this massive effort is all the more impressive considering it is taking place against what is supposed to be an economic embargo, now nearly 14 months old, against Qatar by its fellow Gulf Cooperation Council states. Pirated by “an unknown entity” – who could it have been? Iran? North Korea? (The latter have been acting up quite a bit lately!) In any case, it was quite an impressive job, in that the QNA was hacked pretty much across the board: Twitter, Google Plus, Facebook, Instagram, etc. An achievement like that at least offers one the opportunity to have a little fun. As a somewhat fuller EN-language report on the incident revealed, the hack also reached the QNA TV channel, resulting in the “chyron” of text at the bottom of the nightly newscast reproducing various non-kosher messages, such as that Hamas is “the legitimate representative of the Palestinian people” and that there are tensions between the US and the Qatari governments. One should be able to think of even more humorous applications: how about a tweet from the QNA reading “Pardon, delivery-man wondering where to take that case of Johnny Walker Sheikh al-Thani ordered ?” . . . and the like. The reality, of course, is that such hacks lead to nothing but trouble. Those chyron-statements may raise a chuckle, but they definitely caused red faces among Qatari diplomats. And someone was definitely trying to stir up trouble by messing with the QNA Twitter-feed – but that seems to be exclusively in Arabic. 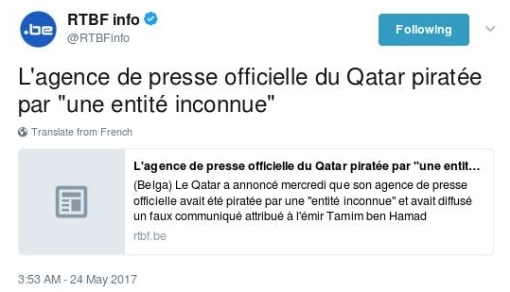 Translation: The foreign minister confirms a conspiracy by Saudi, Egypt, UAE, Bahrain and Kuwait to smear the reputation of Qatar. For those with long-enough memories, this episode will recall that time back in 2011 when hackers took over the FoxNews Twitter account and posted six tweets claiming President Obama had been assassinated. That definitely caused some turmoil, for a short while, on the financial markets. Must do better, QNA! in Brazil later this week, there has been a wave of increasing concern about the event’s scheduled host for 2022, the Persian Gulf emirate of Qatar. This has largely been prompted by the eminent British newspaper The Sunday Times, which has somehow gotten its hands on a treasure-trove of internal e-mails and documents relating to what appears to be the concerted effort spearheaded by the Qatari businessman (and former FIFA vice-president) Mohamed Bin Hammam to buy Qatar the 2022 World Cup outright via the judicious parcelling-out of up to $5 million.
. . . And That’s Not All, Folks! Sure, it’s the cheap, easy, cynical view to adopt that the bail-out/splintering of the French/Belgian/Luxembourgish bank Dexia, worked out over the weekend, is just going to be the first of many such episodes. Then again, it’s also the de rigueur statement for any finance minister involved to make under such circumstances – “No, I don’t think so, certainly not French banks” – such as that which French finance minister François Baroin uttered when asked by reporters if there would be any others. Of course there will be others. For heaven’s sake, there were already two others (i.e. European bank nationalizations) happening even as Dexia hogged the headlines the past few days. (Details here, in English: namely a Greek bank – surprise! – that was nationalized after getting in trouble over money-laundering, and a Danish bank that made foolish real estate loans.) And now we have further explicit confirmation of this from Kleis Jager at the Dutch newspaper Trouw: French prepare in secret for more misery. Topped by an unfortunate photo of current (unelected) Belgian Prime Minister Yves Leterme and France’s PM François Fillon with sly, conspiratorial smiles on their faces, Jager’s piece tells of how, even before Dexia, the French government realized that it needed to get ready to save at least “two or three” big banks – preferably by forcing them to sell themselves to outsiders with big money. Wait, you want names? No problem: according to Trouw, the French had in mind specifically BNP Paribas, Société Générale and Crédit Agricole as the banks where they would need to intervene. No Dexia on that list! But all of these have done good business through the years – “good” so far – providing loaned money to not only Greece, but also Spain and Italy. To be fair, this is not Jager’s scoop, but rather one he credits to the French paper Journal du Dimanche. BNP Paribas and Société Générale immediately issued denials once the latter had published its report. But I refer you again to Finance Minister François Baroin’s comments cited above.